You might be interested in buying into the quietest electrical power generator? There is no fuel to keep up with and pour (and spill). Maintenance is very minimal for the panels, just wiping them off, ensuring they are well-attached to the RV, and keeping the wires secure and free of chafing. You should already be tending your batteries to keep them clean, topped off with distilled water (unless yours are “no-maintenance”), and keeping the connections tightened, no matter whether you have solar panels or not. Solar makes sense for more RVers than just full-timers. These roof-top battery chargers allow us to go most of the year without ever needing to use the trailer’s electrically-powered battery charger. A small solar charging system can tend your batteries for your RV without any shore power connections. A larger system can keep up with all your daily uses for your RV’s batteries including fans, lights, water pump, and even ham radio operations. 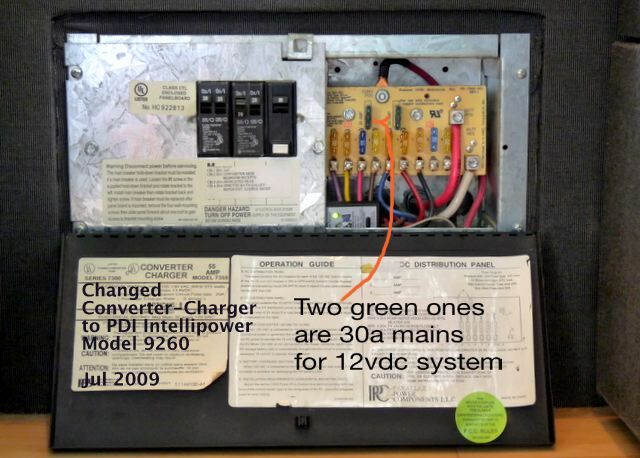 Still higher end systems can also provide all the DC, or 12 volt power, as well as your 110 volt power for your RV. You could run your microwave, hair dryer, coffee pot and more from your batteries, all recharged with solar panels. Beware though, there are costs to all this. The trick, as with so many things, is to strike your optimal balance between cost and benefit. Before you consider buying anything, study up a bit. Don’t buy anything yet! The two links that follow this paragraph provide helpful information about solar panels, controllers, what sizes are useful. Look at http://www.windsun.com, halfway down the page. They have “Solar Information Pages” with good learning info about solar. Look at amsolar’s rv_solar_education pages. They provide good learning info. The meter we installed in October 2013, in case you did NOT read the article I just told you to, is a Trimetric 2025RV. It costs $180 from BestConverter, including the required shunt. You can see it through this link. We bought the approx 25′ of control wire from a really neat store in Boise Idaho, they spooled off 25′ of Cat5 for about $5. We had the battery cables we needed to connect the meter in-line with our batteries and the house. No one told us to have a cooling off period or to learn more. Well, we learned more anyhow — we studied our fannies off learning about so many sizes and brands of solar. Solar was smoking hot in 2007, the dealers could not keep good panels on the shelves. Same with charge controllers (you already learned in the first two links way above, these are very important), they were often unavailable. We somehow stumbled upon a very nicely documented description of installing solar panels ON OUR VERY RV — Yep, Don had installed a pair of solar panels atop a 2005 Airstream CCD 25 trailer. Wow, we’re supposed to do this. We tried to be just like Don. We ordered the same kit from the same place, put our panels in the same spot, installed our charge controller in the same blank panel. This is too easy! Well, it wasn’t quite so simple. You see, you have some days luckier than others. The day we installed our solar panels was a less lucky day. Jim drilled holes in our trailer’s roof. Eight 5/16″ holes, four feet for each panel, didn’t take very long to make. The panels attached easily to the roof with the supplied mounting hardware and . . . Inside the trailer the 12 volt lights didn’t work anymore. Oh, it’s probably something really simple. No. A wire must be cut somewhere from all that drilling. see the patched hand-hole from patching wires? After much snarling and searching and spending sleepless nights, Jim found the one hole in which the drill bit had touched two wires. The insulation stripped off, the two wires were crossed and shorting out. Finding the problem was the hard part. Jim spent only an hour or two fixing these two wires and our solar charging system has worked fantastically since. Here is one more link, to a seller with very nearly the same system we bought over five years ago. This is our favorite system, the 270 watt one, close to what we have but seems a bit sharper and is certainly much less expensive than what we paid then. The technology has improved in five years, although we’ve read the manufacturing may be lower quality. The article we read from NY Times reported a case where the failure rate for newly manufactured panels has risen from below 5% to between 13 and 22%. We are now more advanced users due to lots of practice — full-time with the solar charging system for over five years. All the components are original, but we’ve enlarged the battery storage to four 6v golf cart batteries. Jim can now rest assured of having full power for his ham radios before sun-up tomorrow, every day. Debbie rests confident Jim will not once ask her, “are you still using that light or may I turn it off for you?” We have lots of battery capacity. Jim installed a neat tilting system for our solar panels. Our panels can be up to 30% more effective by tilting than if lying flat on our roof. This is especially useful in winter months, when the sun is much lower angle in the sky and solar gain is much harder to obtain. Our panels, tilted up, are ready to get all the solar they can in winter. At least each quarter-year, Jim changes the amount of tilt to correspond with the sun’s higher, or lower, path across the sky. And no, we do not travel down the road with the solar panels tilted up. The panels lie flat on the roof for travel. Jim can easily and quickly tilt the panels, standing on a ladder leaned against the trailer’s side.